Well, one night away, but it felt like days and days which was exactly what I needed! One of the awesome stores that I sell to here in Michigan, Found Gallery, click here to check them out, moved into an absolutely amazing new space and had a grand opening party featuring their artist makers, so of course I went! The owner Mary truly has a talent for gathering amazing items and merchandising them like a dream, plus her staff is wonderful! If you’re in the area drop in, you won’t be disappointed! I guess I was so busy chatting it up and checking things out I didn’t take interior shots! What, I know, sorry! 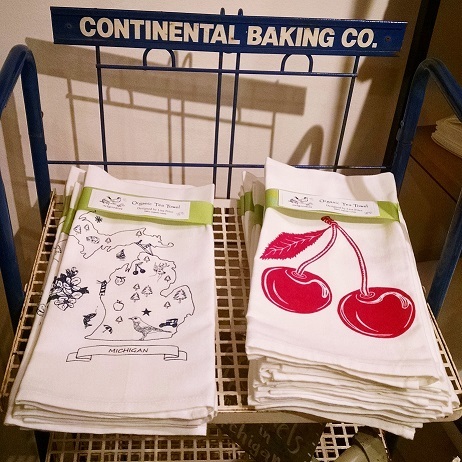 I did however nab a pic of a couple artgoodies towels they carry in this awesome vintage bakery display rack! I had originally planned to nab a Priceline hotel outside of Ann Arbor on the cheap heading back towards home. BUT, for some reason the hotel prices were absurd that weekend, maybe someone was having a college football home game or something of the sort or maybe the prices in the area have increased far beyond what they used to be when I stayed there all the time. 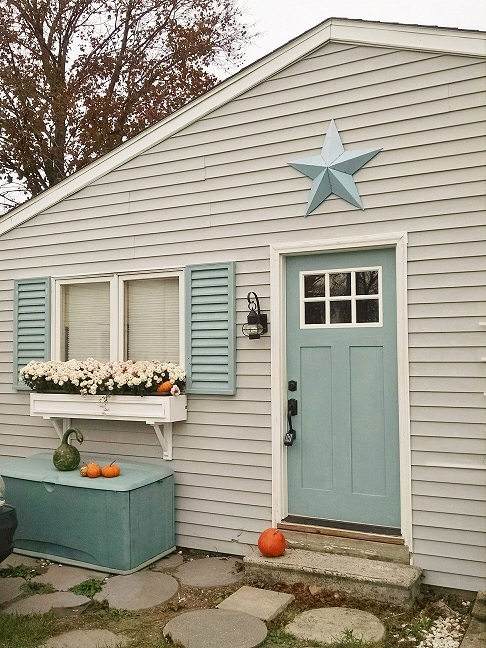 Anyway, my brother’s guest room in Lansing was booked for the weekend, it was farther than I hoped to drive after the opening, so I hopped on Airbnb and found myself a darling cottage for the night for cheaper than I could nab a dumb hotel. What! Yes please! 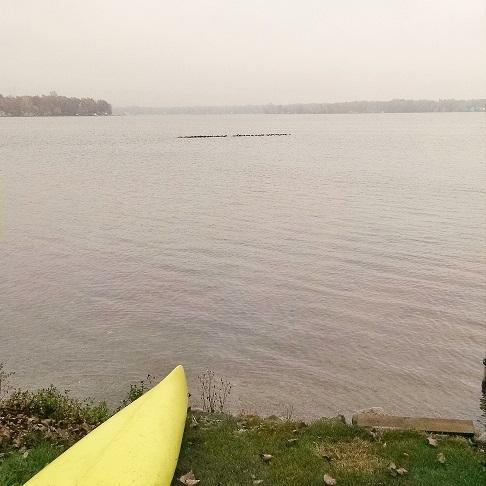 It was on Portage Lake, about a 25 minute drive from Ann Arbor and just the thing I needed for a little mental break getaway. This little place couldn’t have seemed more like it was meant for me! 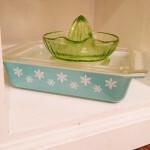 Darling from the outside, great vintage pieces on the inside, I immediately felt right at home! Even though Sue the owner was out of town I felt like I met a kindred spirit just by being at her place. 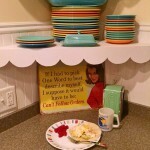 Many of my favorite things were abound, check out the pics, you’ll see! 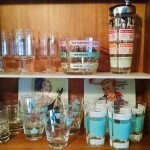 Pyrex in the kitchen, vintage Beauty Queen cabinets with new boomerang countertops, scallop shelf accents, great mid century furniture pieces, vintage glassware, I mean come on! And if you’d like to see more and have a lovely getaway book it here! Sue responded lightning fast, I’d definitely book again, and you could even sleep someone on the couch! Great for yourself, you and your darling, or you and your best pal! Do it! I think it would be great all seasons! I enjoyed the hazy fall morning and watched hundreds of migratory coots come in, an eagle fishing, saw 20 some odd swans in the distance, and a gorgeous heron, among other wildlife. See! ALL of my absolute favorite things! The perfect blend of a getaway for me! 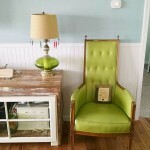 This vintage chair, and green and blue my fave! 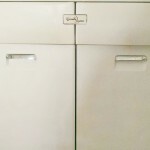 vintage Beauty Queen cabinets, and new boomerang countertop! Color of the Month October 2015! October. My all time favorite seasons are coming to an end and the busy season is starting up and the chill is beginning to edge in a bit. Honestly, this time of year always makes me feel a little blue as gardens wane and leaves fall. There’s nothing like the growth,green, flowers, color, sunshine, and warm fresh air of spring and summer to feed my soul and make me feel whole. I’m still taking advantage of those beautiful days outside, even though I slipped into a pair of boots for the first time last week, NO! You know how much I hate socks and wish I could just run around barefoot in flip flops all year long! It’s a season of change, and this year I’m seeing some extra things happen around me with the people I love. Some wonderful things are happening that are exciting and then there are some things happening that are hard and are just breaking my heart as their season brings big change. Life, like the natural world, has so many seasons. 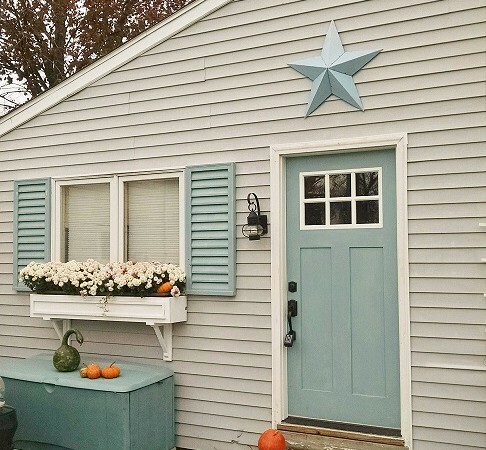 And so, color of the month October 2015 seems ever so fitting as blue. 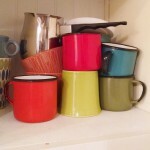 Color of the Month October 2015! 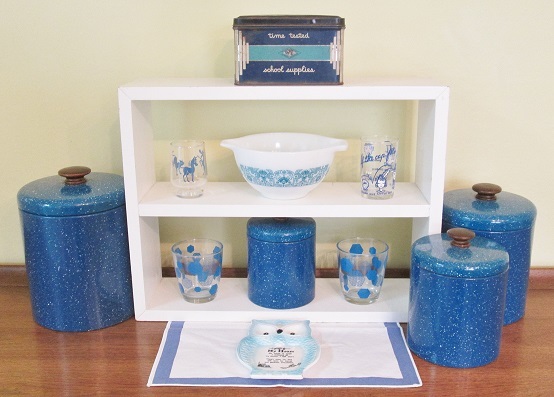 Fave Vintage: blue speckled Ransburg canister set, assorted awesome glassware, super old chalk tin, owl home saying spoon rest, Pyrex in the horizon pattern from my own personal mixing bowl set. 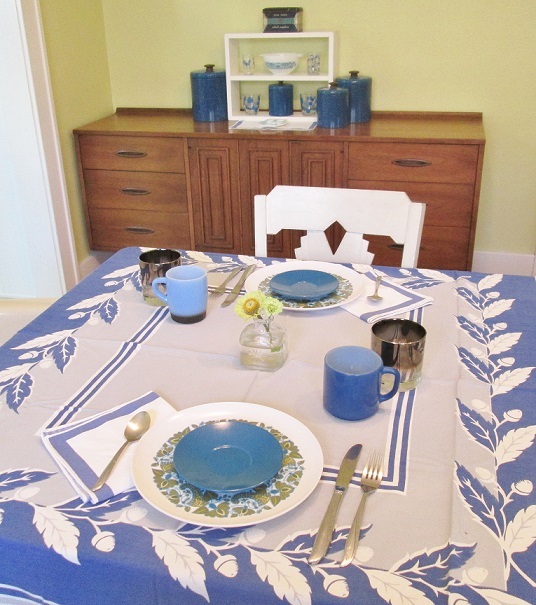 Color of the Month Oct 2015 table setting! 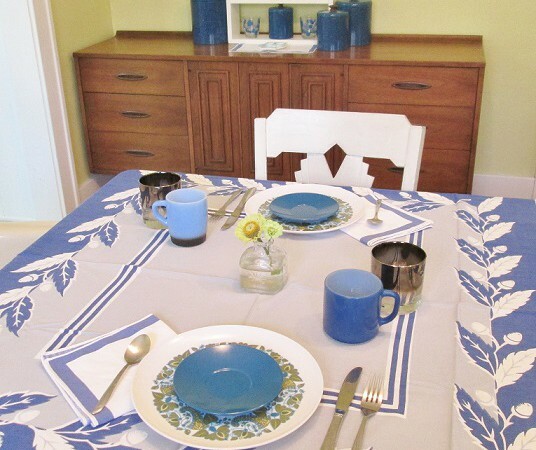 Fave items: the awesome oak tablecloth, a great twist of color to the season! Melmac plates with saucers for a pop of color, ombre cocktail glasses, milk glass mugs, blue stripe napkins, and my usual twin star silverware by Oneida.